The Man Portable Ex-GEN DEFENDER from Fidelity Technologies Corporation is the reliable choice for your portable electric power requirements; specifically designed, built and tested with the warfighter in mind. Utilizing innovative patented technology, this lightweight, portable generator operates on military grade JP-8 or F-24 fuel and starts dependably in even the most austere climates without the need for any starting agents. Rigorously tested for harsh environments, this durable and compact generator automatically maintains optimum internal operating temperatures for peak performance. 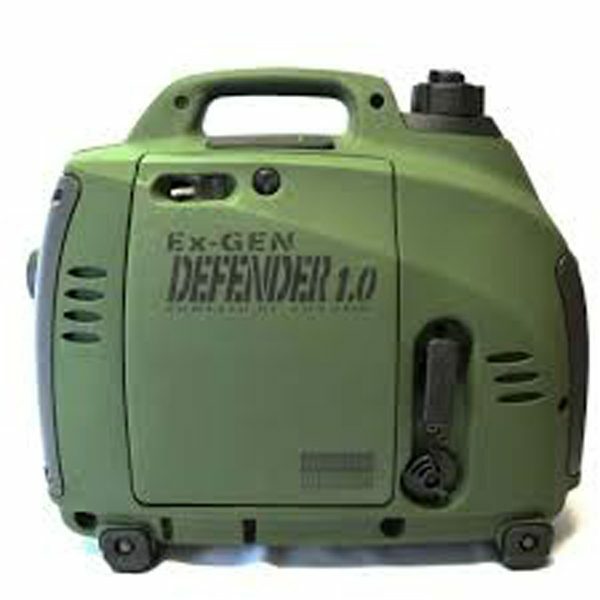 With a dry weight of less than 33 pounds, the Ex-GENTM DEFENDER is the undeniable solution to provide the warfighter with a true expeditionary portable generator that provides continuous 900W (1000W Peak) of clean AC power. To accommodate power requirements that exceed a stand-alone Ex-GENTM DEFENDER output, a second Ex-GENTM DEFENDER can be coupled in parallel using an optional interface cable, providing up to 1800W of usable power.